Henry Pomeroy Davison, founding father of the League of Red Cross Societies. Guided by Strategy 2020 – the IFRC's collective plan of action to tackle the major humanitarian and development challenges of this decade – the IFRC is committed to saving lives and changing minds. The IFRC is part of the International Red Cross and Red Crescent Movement along with the International Committee of the Red Cross (ICRC) and 190 National Societies. The IFRC's strength lies in its volunteer network, community-based expertise and independence and neutrality. It works to improve humanitarian standards, as partners in development and in response to disasters. It persuades decision makers to act in the interests of vulnerable people. It works to enable healthy and safe communities, reduce vulnerabilities, strengthen resilience and foster a culture of peace around the world. The seven Fundamental Principles that guide the work of the IFRC and its members are: humanity, impartiality, neutrality, independence, voluntary service, unity and universality. On 5 May 1919, following the First World War, representatives from the National Red Cross Societies of the Allied Powers (Great Britain, France, Italy, Japan, and the US) came together in Paris to establish the League of Red Cross Societies (LORCS) whose stated goal was "to strengthen and unite, for health activities, already-existing Red Cross Societies and to promote the creation of new Societies". The initiative was taken by Henry P. Davison, then chairman of the American Red Cross' “War Committee”, with the support of Woodrow Wilson, the President of the United States of America. Davison was assisted by the British general Sir David Henderson who became the first Director-General. This newly created federation of National Societies expanded the international mandate of the Red Cross Movement beyond the strict mission of the International Committee of the Red Cross (ICRC) to include relief assistance in response to emergencies which were not caused by armed conflict. In addition to the coordination of relief operations caused by natural disasters and health emergencies, the league's mission was to assist National Societies in their founding and development, especially in peacetime. In addition to providing assistance to victims of epidemics, natural disasters (earthquakes, floods and hurricanes) and famines, two other activities were developed during the first years of the league. One main activity was to promote health by preventing illnesses and developing the training of nurses and volunteers. The other activity was to create the Junior Red Cross within the National Societies, which introduced children and students to the Red Cross with various educational courses and involved them in practical relief activities. The formation of the league, as an additional international Red Cross organization alongside the ICRC, was not without controversy. The ICRC had, to some extent, valid concerns about a possible rivalry between the two organizations. The foundation of the league was seen as an attempt to undermine the leadership position of the ICRC within the Movement and to gradually transfer tasks and competencies to a multilateral institution. As well, Davison did not want to include National Societies of the defeated powers, namely Germany, Austria, Hungary, Bulgaria and Turkey, which was contrary to the ICRC's principle of universality. Moreover, the league's beginnings were expeditious as it took 154 days between the approval of President Wilson and its incorporation. This hasty formation forced Davison to cut corners and leave unresolved issues such as a clear framework of the league's mandate, duties and funding. The coexistence concerns between the league and the ICRC were discussed during three consecutive International Conferences of the Red Cross (1921, 1923, 1926). The statutes adopted in 1928 at the XIIIth International Conference of the Red Cross in The Hague clarified and confirmed the roles of each entity. In that same year, the "International Council" was founded to coordinate cooperation between the ICRC and the league, a task which was later taken over by the Standing Commission of the Red Cross and Red Crescent. In 1920, the league's “General Council, originally composed of representatives of the victorious Allies”, welcomed additional National Societies; 27 out of the 31 member societies were represented in 1920. In the following decade, the league admitted over 25 National Societies, including the Egyptian Red Crescent and the Red Lion and Sun of Iran. Following the adoption of the Statutes of the International Red Cross in 1928 (revised in 1952 and 1986, amended in 1995 and 2006), the National Societies of the Nordic Red Cross (Denmark, Finland, Sweden and Norway) returned to the league after resigning three years earlier because of the discords within the Red Cross movement. The Alliance of the Red Cross and Red Crescent Societies of the Soviet Union joined the league during the XVth International Conference in 1934. By the mid-1930s, the league became truly universal, with 58 registered National Societies. The league's headquarters, named the secretariat, was originally based in Geneva. The league moved its secretariat from Geneva to Paris in 1922 with a restrained budget and reduced staff. The need to move away from the ICRC to further develop the league's own identity was part of the decision-making. On September 5, 1939, days following the German troops invasion of Poland, the league personnel in Paris were moved to Geneva. The league believed it could ensure the continuity of its work from a neutral country such as Switzerland. To this day, the secretariat's offices have remained in Geneva, but it was only in 1959 that the secretariat moved into its current headquarters in Petit-Saconnex..
During the first years of the league, the work was essentially reactive and consisted mostly of recording information and statistics to be shared with the National Societies. The league's first operational mission was to perform onsite observations of the conditions of the victims of a typhus epidemic in Poland, and to develop and circulate information material to the surrounding countries to prevent the spread of similar epidemics diseases. The first large-scale relief action of the league came after the 1923 earthquake in Japan which killed about 200,000 people and left countless more injured and without shelter. For the first time, 35 National Red Cross Societies participated in a joint action of the ICRC and the league, for which the record sum of 277 million Swiss francs was donated. The league began issuing appeals in 1925 but appeals were not consistently issued for all disasters. During the 1920s and 1930s disaster relief remained a minor activity, behind public health, nursing and youth activities. The National Societies, with the league's assistance in the 1920s, were better prepared to deal with disaster relief and consequently less in need of external assistance. Additionally, the Great Depression caused economic insecurity worldwide, urging the league to dedicate more coverage to poverty programs. 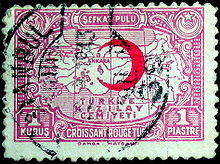 A stamp from Turkey to support the Red Crescent, 1938. The 1930s saw the growing use of the automobile, the development of road infrastructure and consequently the increase of traffic and casualties. The league became a leader in first aid prevention for road accidents, by establishing in 1932 a Permanent Committee on First Aid on Roads, with the collaboration of various motoring associations. As the world headed closer to another war, the activities of the league reduced considerably. Nonetheless, the collaboration between the league and the ICRC continued to grow. The league provided support to the ICRC in the late 1930s, notably during the Spanish Civil War and the Second Sino-Japanese war, by issuing appeals and establishing distribution points of food and medical supplies for the civilians. The Joint Relief Commission, initiated by the ICRC in 1941, established the mandates of the league and the ICRC, ensuring their continuous support to the National Societies amid the intensifying war. This agreement also increased the National Societies' independence and allowed them to pursue their civilian relief activities without causing friction with the belligerent, occupied and neutral states. The Federation is honored at the Nobel Peace Prize ceremony in 1963. From left to right: King Olav of Norway, ICRC President Léopold Boissier [de], and League Chairman John MacAulay. After a six-year hiatus, the board of governors held its first meeting in October 1945. The post-war period provided a new driving force to the league as it resumed its relations with the National Societies and provided relief to war-affected regions. Following disastrous weather conditions that afflicted parts the world between 1951 and 1954, the league's relief activities became more operational and were no longer entirely informational. During those years, the league issued numerous appeals and showed great efficiency in disaster relief operations. In the late 1950s, there was a marked increase in the number of recognized Red Cross and Red Crescent National Societies due to decolonisation. By the end of the 1960s, there were more than 100 societies around the world. On December 10, 1963, the league and the ICRC jointly received the Nobel Peace Prize. In 1983, the League of Red Cross Societies was renamed to the "League of Red Cross and Red Crescent Societies" to reflect the growing number of National Societies operating under the Red Crescent symbol. Three years later, the seven fundamental principles of the Movement, as adopted at the XXth International Conference of the Red Cross in 1965, were incorporated into the league's statutes. The name of the league was changed again during the General Assembly of 1991 to its current official designation the "International Federation of Red Cross and Red Crescent Societies" (IFRC). In 1997, the ICRC and the IFRC signed the Seville Agreement which further defined the responsibilities of both organisations within the Movement. In 2004, the IFRC began its largest mission to date after the tsunami disaster in South Asia. More than 40 National Societies worked with more than 22,000 volunteers to bring relief to the countless victims left without food and shelter and endangered by the risk of epidemics. The IFRC coordinates between National Red Cross and Red Crescent Societies throughout the world. The IFRC along with ICRC supports the foundation of new National Societies in countries where no official society exists. A National Society is admitted as a member to the IFRC only after it is recognized by the ICRC. The IFRC cooperates with the National Societies of the affected countries - called the Host National Society (HNS) - as well as the National Societies of other countries willing to offer assistance - called Partner National Societies (PNS). Among the 190 National Societies admitted to the General Assembly of the IFRC as full members or observers, about 25-30 regularly work as PNS in other countries. The most active are the American Red Cross, the British Red Cross, the German Red Cross, and the Red Cross Societies of Sweden and Norway. Another major mission of the IFRC which has gained attention in recent years is its commitment to work towards a codified, worldwide ban on the use of land mines and to bring medical, psychological, and social support for people injured by land mines. The IFRC has its secretariat in Geneva. It also has five regional offices and numerous country and multi-country cluster offices around the world. The secretary general is Elhadj As Sy (Senegal). The IFRC is governed by a governing board consisting of a president, four vice-presidents, the chairman of the finance commission and 20 National Society representatives. The highest body of the IFRC is the General Assembly which convenes every two years with delegates from all National Societies. Among other tasks, the General Assembly elects the president. The current president of the IFRC is Francesco Rocca, who also fulfills the role of president of the Italian Red Cross. As of 2017[update], the president of the IFRC is Francesco Rocca (Italian Red Cross). The vice presidents are Annemarie Huber-Hotz (Swiss Red Cross), Miguel Villarroel (Venezuela Red Cross), Abdoul Azize Diallo (Senegalese Red Cross Society), Kerem Kinik (Turkish Red Crescent), Chen Zhu (Red Cross Society of China). The IFRC is funded by statutory contributions from National Societies, the delivery of field services to programme partners, and voluntary contributions from donors such as governments, corporations and individuals. The criteria for the statutory contributions of each National Society are established by the Finance Commission and approved by the General Assembly. Additional funding, especially for unforeseen relief assistance missions, is raised by emergency appeals. From 2005 to 2015, the Chairman of the Finance Commission was Mr. Chrystold Chetty (Seychelles) and the Vice- Chair was Ms Kathryn Forbes (United States). From 2016, the Chairman is Mr. Abdulkader Husrieh. Ms Kathryn Forbes has been nominated the Chairperson of the Audit and Risk Committee whilst Mr. Chrystold Chetty has been elected as a member of the Standing Commission of the Red Cross and Red Crescent. The emblem of the IFRC is the combination of a red cross and a red crescent on a white background, surrounded by a red rectangular frame without any additional text. The red cross, the original symbol of the Movement, is on the left while the red crescent appears to the right. Per Humanitatem ad Pacem is the primary motto of the IFRC (Article 1 of the Constitution of the Federation). The mission statement of the IFRC, as formulated in its "Strategy 2010" document is to improve the lives of vulnerable people by mobilizing the power of humanity. From 1999 to 2004, the common slogan for all activities of the International Movement was The Power of Humanity. In December 2003, the 28th International Conference in Geneva adopted the conference motto Protecting Human Dignity as the new slogan for the entire Movement. The official logo for the International Red Cross and Red Crescent Movement published in April 2016 was described as the red cross and red crescent emblems placed together side by side, encircled by the words "INTERNATIONAL MOVEMENT" in one or other of their official languages (Arabic, Chinese, English, French, Russian or Spanish). It was described as for use when the ICRC, the International Federation of Red Cross and Red Crescent Societies and the National Red Cross and Red Crescent Societies operate together for the purposes of a humanitarian emergency, or a theme or campaign of global concern. The IFRC has come into conflict with the ICRC at various times, first and foremost when the American Red Cross threatened to supplant the ICRC with its creation of the league as "a real international Red Cross" after the First World War. Several agreements about the respective roles of the organizations helped to smooth relations, beginning with the agreement of 1928, the 1997 Seville Agreement and most recently the Supplementary Measures of 2005. The Seville Agreement gives the IFRC the lead in any emergency which does not take place as part of armed conflict (in which case the ICRC takes charge). Organizational discord has now largely subsided. ^ "The Governing Board - IFRC". www.ifrc.org. ^ "Home - www.redcross.int". www.redcross.int. ^ "The International Red Cross Red Crescent Movement on the Internet". Who we are. International Federation of Red Cross and Red Crescent Societies. Retrieved 18 November 2013. ^ "Strategy 2020". Who we are. International Federation of Red Cross and Red Crescent Societies. Retrieved 18 November 2013. ^ "IFRC: Everyone Counts Report 2018" (PDF). ^ "The Nobel Peace Prize 1963". www.nobelprize.org. Retrieved 2017-12-13. ^ "IFRC: Everyone Counts Report 2018. p. 22" (PDF). ^ IFRC: Who We Are: The Secretary General. ^ "A logo for the International Red Cross and Red Crescent Movement". 13 April 2016. ^ Andre Durand, History of the International Committee of the Red Cross: From Sarajevo to Hiroshima, Geneva: ICRC, 1984, p. 147. Wikimedia Commons has media related to International Federation of Red Cross and Red Crescent Societies.